Shihan Jarrett is often featured in local, national, and international publications. In addition he is a sought after contributor for industry magazines and trade journals that highlight traditional martial arts. Take a moment to read a sampling of the articles recently written about Jarrett Sensei and the USA Martial Arts Federation. The USA-NKF website is the premier site for International and National Olympic Karate news. Make sure you monitor it often to keep updated on the status of Karate in the United States and Shihan Jarrett's travel plans and updates. You can visit the site at www.usankf.org. Like a proud father, I am very excited to announce that our very own Jake Lease has been named the new CEO for USA Karate (USANKF). At our recent USANKF Board of Directors meeting in January, Jake was promoted to this position by a unanimous vote. Jake has been working extremely hard over the past few years as the USANKF Director of Events and Member Services at our Colorado Springs office. Mr. Lease has done a fantastic job directing our two large events, the USA Open in Las Vegas each year, and our annual National Championships. He has also been essential in coordinating US Team travel around the world. He will continue that and more in his new position. Jake is from Bancroft, WV and started his Martial Arts training with me at the age of ten. As a teenager he became a junior assistant instructor at our Teays Valley location, and competed regularly in local, regional, and national karate championships. He went to college at the WV Institute of Technology in Montgomery, WV, where he also trained and assisted at our USA Martial Arts Montgomery branch. Jake eventually became a senior instructor at our USA Martial Arts Federation Headquarters Dojo in St. Albans, WV. He worked tirelessly teaching at both the St. Albans and Kanawha City locations. He soon served not only as a senior instructor, but as the Office Manager at the USAMAF national headquarters as well as my direct personal assistant. Sensei Lease holds several Martial Arts ranks including 4th Dan in Tae Kwon Do, 4th Dan in Karate Do, 3rd Dan in Aikido, 3rd Dan in Judo, 3rd Dan in Jujitsu, and 3rd Dan in Iaido. He also became one of our youngest ever Pan American Karate Referees. His skill and knowledge I the Martial Arts is outstanding. During my tenure as both Secretary General and President of the USANKF, Jake was my right hand. He honed his skills for his present position traveling with me to many events. He assisted me as I negotiated, developed, and ran many national events. Jake was part of the development of the USA Open as we held the very first one in West Virginia. He helped tremendously as we salvaged the event after everything was dropped in out laps. After I hired Luke St. Onge as our Executive Director we sent Jake out to assist him with our new USANKF office in Colorado Springs. Luke was familiar with the workings of the USOC but really knew nothing about the sport and art of Karate. Jake hit the ground running and was excited to serve the Olympic Karate movement. I have full confidence that Jake will do a tremendous job as CEO. All of the Instructors and student of the USA Martial Arts Federation wish him well in his new position. He needs all our prayers and support. His love of the Martial Arts and his great hope for the future of Olympic Karate is unbounded. Shihan Roger Jarrett, president of the USA Martial Arts Federation, has been selected for the West Virginia Sports Hall of Fame presented by “West Virginia Executive Magazine”. In the latest issue ( Spring 2010) of WV Executive Magazine, West Virginia’s premier business magazine, Master Jarrett was selected along with many other notable sports figures such as Jerry West, Randy Moss, Don Nehlen, Lou Holtz, Jeff Hostetler, Pat White, Chad Pennigton, and Phil Pfister, just to name a few. On January 14 & 15, 2011, the USA Martial Arts Federation and the USA Judo/Jujitsu Association in cooperation with the US Jujitsu Federation, held a special Judo and Jujitsu seminar at the USA Martial Arts Training Centers National Headquarters in St. Albans, WV. Seminar instructors were Shihan Roger Jarrett, 8th Dan, president of the USAMAF and the USAJJA, and Shihan Bruce Bethers, 8th Dan, president of the USJJF. The two days of instruction included a variety of throwing, groundwork, and self defense applications of Judo and Jujitsu. The dojo was packed full of participants in this very exciting annual event. Students and instructors from all over West Virginia, Maryland, Pennsylvania, Virginia and Ohio attended this years training. A very special part of the weekend was the Black Belt examinations. The Black Belt candidates put on a great display of techniques. Chris Jarrett and Kevin Seagle received their Shodan (1st Dan) rank, Todd Stanford received his Nidan (2nd Dan), Chris Wood received his Sandan (3rd Dan), and Mike Jacobs did an outstanding job to move up to Yondan (4th Dan). All of their ranks were certified in both Judo and Jujitsu. A special treat was 11 year old Gunnar Stanford, the first student to receive Shodan (1st Dan) in the USAMAF children’s Aiki-Judo program. He had to display an array of Aikido, Judo, and Jujitsu skills for his test. He also teamed with his father to perform the traditional Judo “Nage no Kata”. Congratulations to all the new promotions! 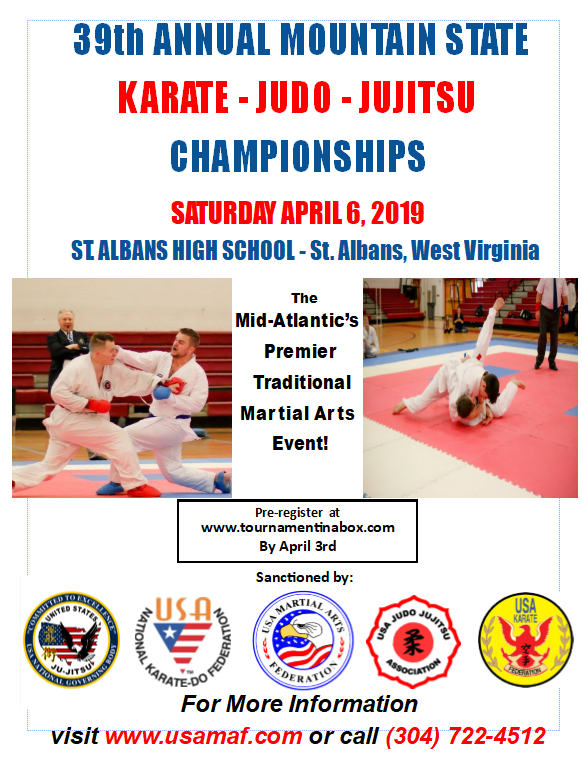 On April 16, 2011 the USA Martial Arts Federation in conjunction with the US Jujitsu Federation, will host the US Jujitsu National Championships and US Team Trials at St. Albans High School in St. Albans, WV. This event will be held together with the 31st Mountain State Martial Arts Championships. You don’t want to miss this very exciting competition. Master Jarrett was on hand with his son Chris Jarrett to lead a special Sport Judo in Karate Competition Seminar for the Pennsylvania Shotokan Karate Club, ran by USA Karate National Coach, Dustin Baldis. The seminar went very well and PSKC photographer Shelly Lipton was on had to capture the weekend with her camera. Shelley Lipton is a psychologist and amateur sports photographer. Part of her graduate research was in sports psychology. Through the lens of her camera, she works to capture interesting and key moments in sports, drawing the viewer into the image with a heightened awareness of the situation. Click Here to see the amazing set of photos she took over the weekend.